I started by make a 3 1/2" x 4 7/8" card base with red paper with deers from the North Pole Gazette pad (Recollections / Craft Smith). I added a 3 1/8" x 4 3/4" black rectangle on the front. I add 3 small stitched rectangles (Cottage Cutz) left over from another card, that I matted with cream paper, cut another rectangle to fit the other side of the card, and a stitched circle in black matted in cream. The sentiment was on a journaling sheet, I just cut it off by hand. Love the look of this one ! This is my card n.28, two more cards before Christmas ! 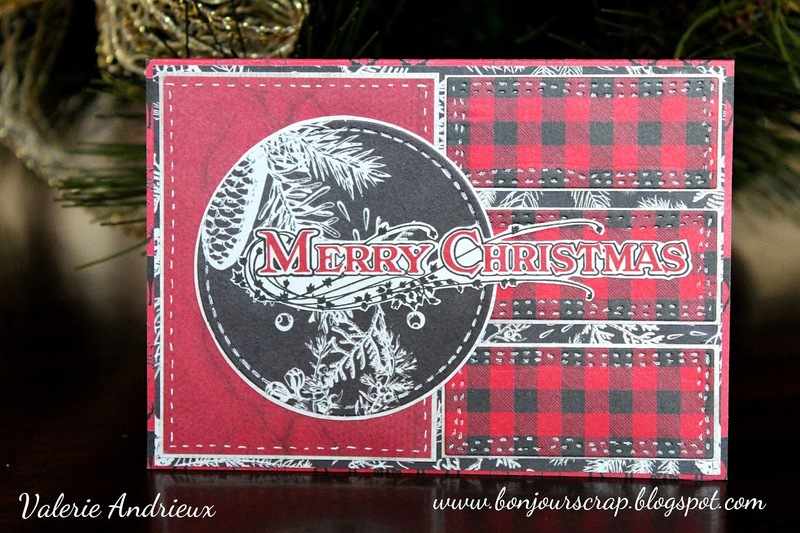 Don't forget to comment on my other cards too to enter my giveaway ! Thank you for stopping by, I know everyone is pretty busy with Christmas preparations. Have a great day and see you tomorrow ! Love the layers on this card and the stitched rectangles!